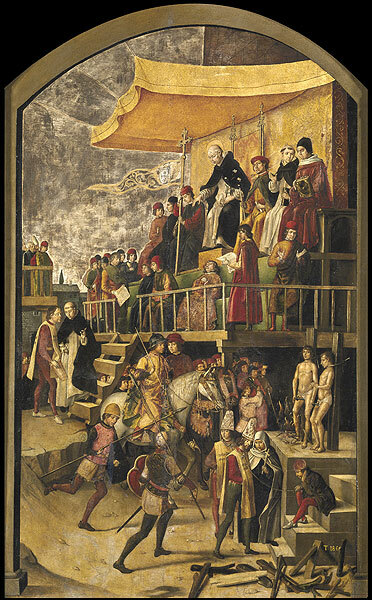 Pedro Berruguete, 16th century (image of the painting found at the Prado Museum, Madrid). The brutal repression engendered by the Inquisition against converted Jews led to the holding of the now infamous "Autos-da-Fé", public trials and executions of those accused of practising Judaism, and which were held with great pomp and ceremony to teach a lesson to all individuals who dissented from what was considered to be the "one true faith". Stone. 18th century, Girona (cession of the Archeology Museum of Catalonia. Girona). 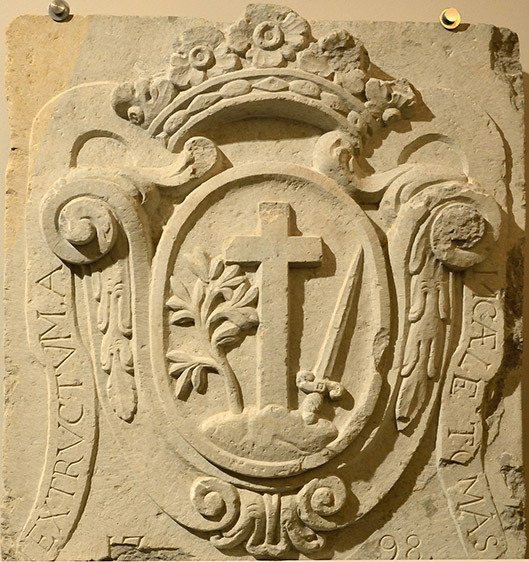 The headquarters of the Tribunal of the Holy Office had a large stone shield outside, which sported a cross, the Christian symbol, a sword to represent the persecution of heresy and an olive branch symbolizing reconciliation through repentance. This shield of the Inquisition may have been on Sant Domènec convent, headquarters of the Holy Office in Girona.